2 Acceptance of Agreement This Agreement is between you and [Our Company]. THIS AGREEMENT CONTAINS WARRANTY DISCLAIMERS AND OTHER PROVISIONS THAT LIMITS OUR LIABILITY TO YOU. PLEASE READ THESE TERMS AND CONDITIONS CAREFULLY AND IN THEIR ENTIRETY, AS USING, ACCESSING AND/OR BROWSING OUR WEBSITE CONSTITUTES ACCEPTANCE OF THESE TERMS AND CONDITIONS. IF YOU DO NOT AGREE TO BE BOUND TO EACH AND EVERY TERM AND CONDITION SET FORTH HEREIN, PLEASE EXIT OUR WEBSITE IMMEDIATELY AND DO NOT USE, ACCESS AND/OR BROWSE IT FURTHER. 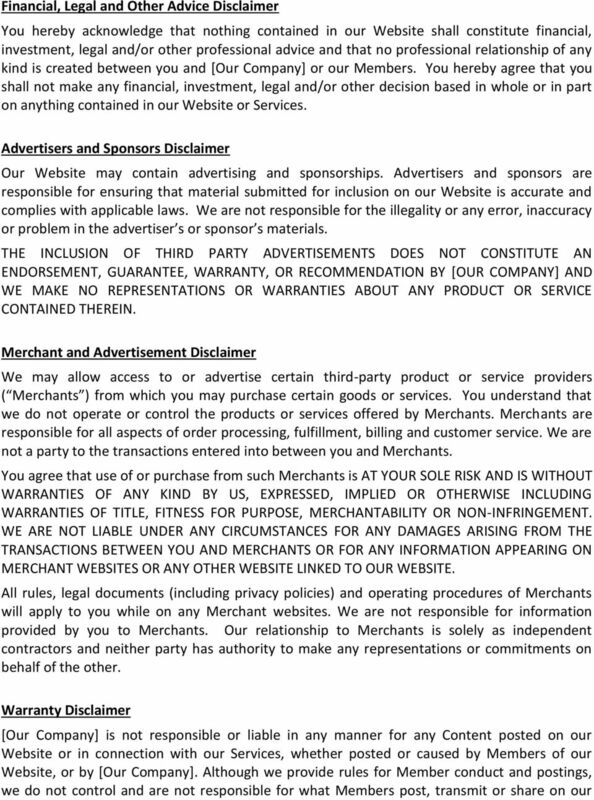 Except as otherwise noted, this Agreement constitutes the entire and only Agreement between you and [Our Company], and supersedes all other Agreements, representations, warranties and understandings with respect to our Website, Services, and the subject matter contained herein. However, in order for you to use our Website and/or Services, you may also be required to agree to additional terms and conditions. Those additional terms and conditions will be incorporated into this Agreement unless otherwise stated. We may amend this Agreement at any time without specific notice to you. The latest Agreement will be posted on our Website, and you should review this Agreement prior to using our Website. After any revisions to this Agreement are posted, you agree to be bound to any changes to this Agreement. Therefore, it is important for you to visit this page periodically to review the Agreement. Please read this Agreement carefully and save it. 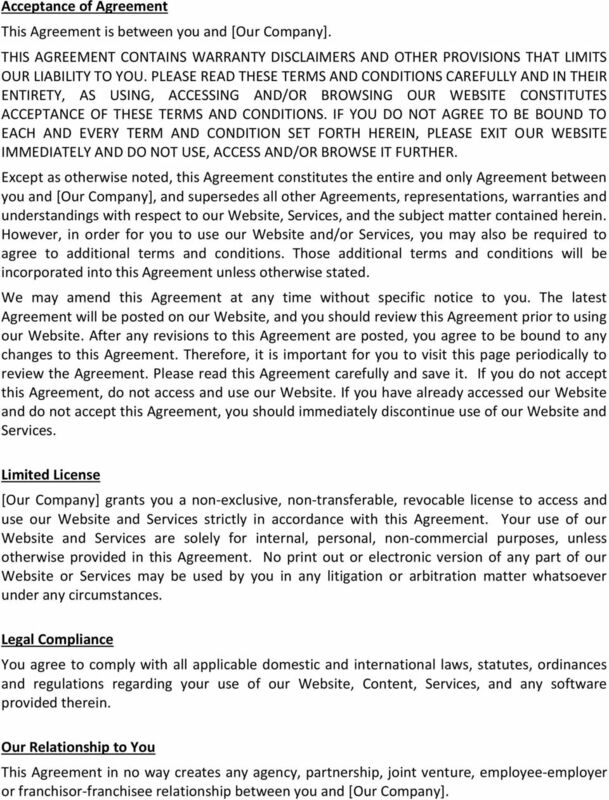 If you do not accept this Agreement, do not access and use our Website. If you have already accessed our Website and do not accept this Agreement, you should immediately discontinue use of our Website and Services. Limited License [Our Company] grants you a non-exclusive, non-transferable, revocable license to access and use our Website and Services strictly in accordance with this Agreement. Your use of our Website and Services are solely for internal, personal, non-commercial purposes, unless otherwise provided in this Agreement. No print out or electronic version of any part of our Website or Services may be used by you in any litigation or arbitration matter whatsoever under any circumstances. Legal Compliance You agree to comply with all applicable domestic and international laws, statutes, ordinances and regulations regarding your use of our Website, Content, Services, and any software provided therein. Our Relationship to You This Agreement in no way creates any agency, partnership, joint venture, employee-employer or franchisor-franchisee relationship between you and [Our Company]. 3 Our Intellectual Property Our Website may contain our service marks or trademarks as well as those of our affiliates or other companies, in the form of words, graphics, and logos. Your use of our Website or Services does not constitute any right or license for you to use our service marks or trademarks, without the prior written permission of [Our Company]. Our Content, as found within our Website and Services, is protected under United States and foreign copyrights. The copying, redistribution, use or publication by you of any such Content, is strictly prohibited. Your use of our Website and Services does not grant you any ownership rights to our Content. 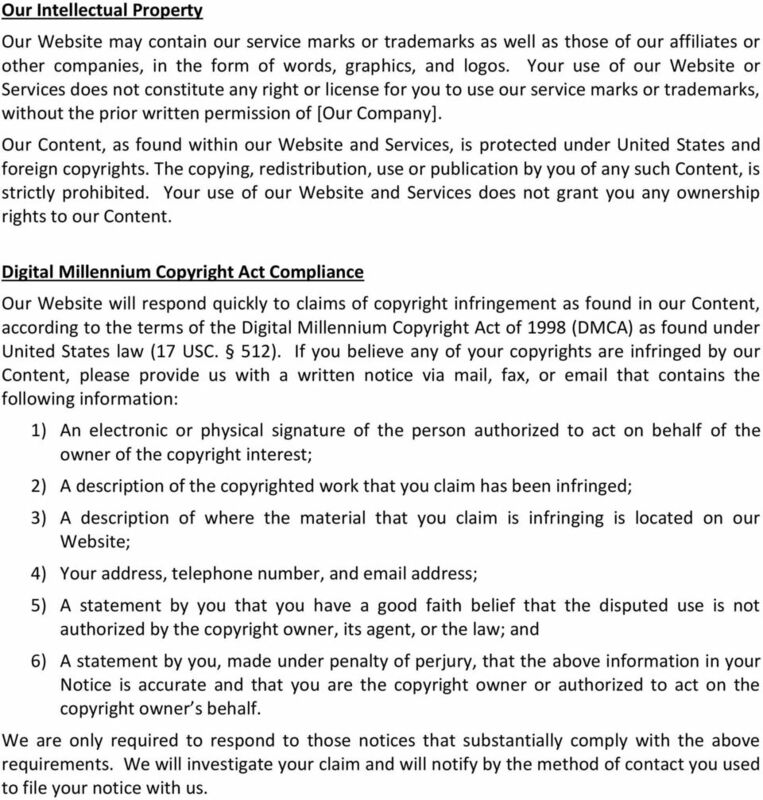 Digital Millennium Copyright Act Compliance Our Website will respond quickly to claims of copyright infringement as found in our Content, according to the terms of the Digital Millennium Copyright Act of 1998 (DMCA) as found under United States law (17 USC. 512). If you believe any of your copyrights are infringed by our Content, please provide us with a written notice via mail, fax, or that contains the following information: 1) An electronic or physical signature of the person authorized to act on behalf of the owner of the copyright interest; 2) A description of the copyrighted work that you claim has been infringed; 3) A description of where the material that you claim is infringing is located on our Website; 4) Your address, telephone number, and address; 5) A statement by you that you have a good faith belief that the disputed use is not authorized by the copyright owner, its agent, or the law; and 6) A statement by you, made under penalty of perjury, that the above information in your Notice is accurate and that you are the copyright owner or authorized to act on the copyright owner s behalf. We are only required to respond to those notices that substantially comply with the above requirements. We will investigate your claim and will notify by the method of contact you used to file your notice with us. 6 Website or Services, and are not responsible for any offensive, inappropriate, obscene, unlawful or otherwise objectionable content you may encounter on our Website or Services. [Our Company] is not responsible for the conduct, whether online or offline, of any user of our Website or Services. Our Website or Services may be temporarily unavailable from time to time for maintenance or other reasons. [Our Company] assumes no responsibility for any error, omission, interruption, deletion, defect, delay in operation or transmission, communications line failure, theft or destruction or unauthorized access to, or alteration of, Member communications. [Our Company] is not responsible for any technical malfunction or other problems of any telephone network or service, computer systems, servers or providers, computer or mobile phone equipment, software, failure of or players on account of technical problems or traffic congestion on the Internet or any combination thereof, including injury or damage to Member s or to any other person s computer, mobile phone, or other hardware or software, related to or resulting from using or downloading materials in connection with the our Website or Services, including without limitation any software provide through our Website or Services. Under no circumstances will [Our Company] be responsible for any loss or damage, including any loss or damage or personal injury or death, resulting from anyone s use of our Website or Services, or any interactions between Users of our Website or Services, whether online or offline. [Our Company] reserves the right to change any and all Content, software and other items used or contained in our Website or Services, at any time without notice. Reference to any products, services, processes or other information, by trade name, trademark, manufacturer, supplier or otherwise does not constitute or imply endorsement, sponsorship or recommendation thereof, or any affiliation therewith, by our Website, by third parties or by any of the equipment or programming associated with or utilized by our Services. 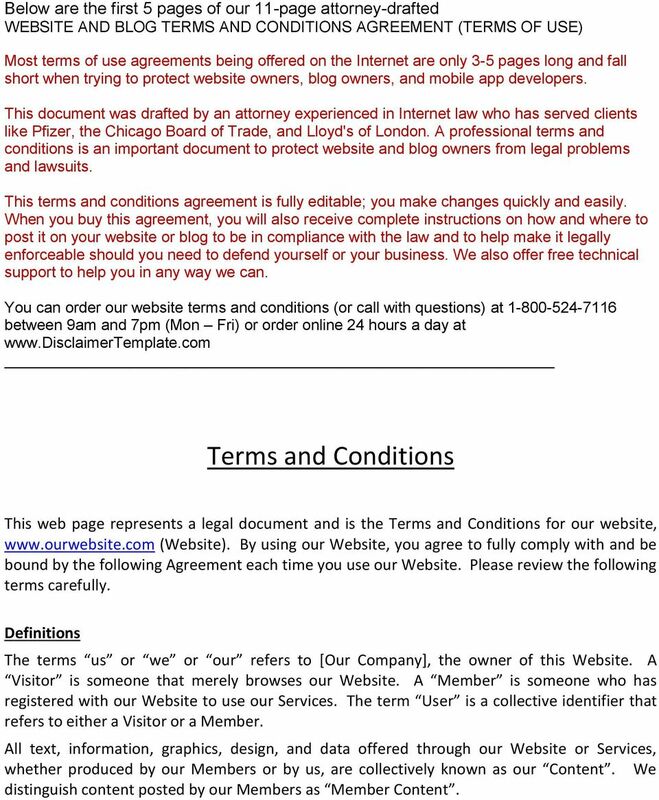 THERE ARE 6 MORE PAGES TO THIS ATTORNEY-DRAFTED TERMS AND CONDITIONS AGREEMENT THAT YOU WILL RECEIVE WHEN YOU BUY IT AT - Our documents, instructions, and information herein referred to as (Content) is protected under United States and foreign copyrights. The copying or redistribution by you of any such Content is strictly prohibited. You may not create derivative works from our Content nor assert or attempt to claim any copyright. TERMS OF SERVICE ----- OVERVIEW This website is operated by Nebraska State Reading Association, hereafter referred to as NEREADS.org. Throughout the site, the terms we, us and our refer to NEREADS.org. These Terms apply both to your use of, and to all Internet traffic visiting, this Web site. Our store is hosted on Shopsite Inc. They provide us with the online e-commerce platform that allows us to sell our products and services to you. you. This warranty gives you specific legal rights, and you may also have other rights that vary from state-to-state. 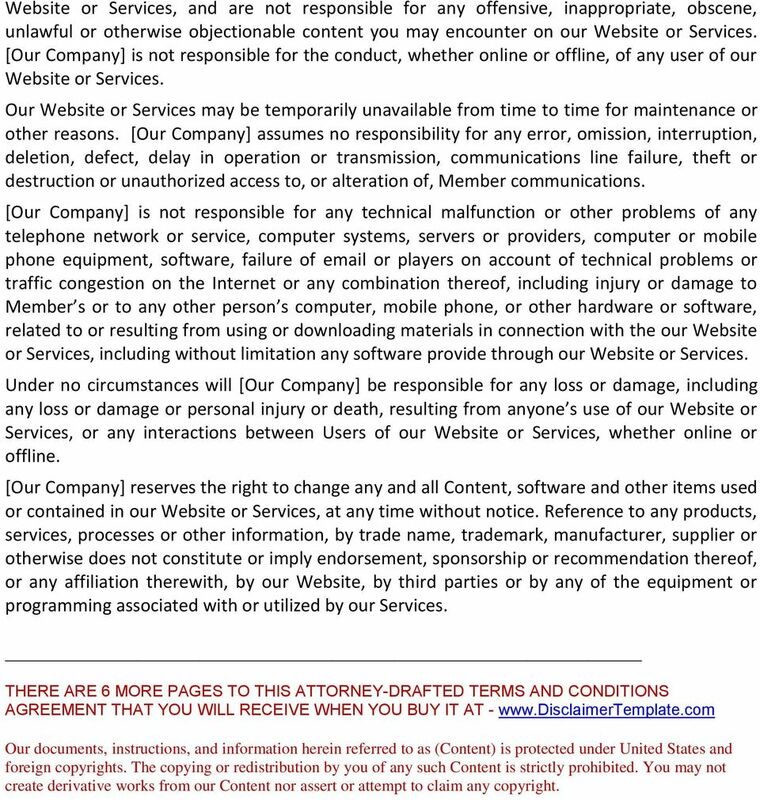 TERMS OF SERVICE ---- OVERVIEW This website is operated by Mill Creek Town Center Business Association. Throughout the site, the terms we, us and our refer to Mill Creek Town Center Business Association. Our store is hosted on GoDaddy web servers, and all payments are handled securely through WooCommerce and Paypal. TERMS OF SERVICE ----- OVERVIEW This website is operated by Rockpool Bar & Grill Administration Pty Ltd. Throughout the site, the terms we, us and our refer to Rockpool Bar & Grill Administration Pty Ltd. IF YOU THINK YOU HAVE AN EMERGENCY CONTACT YOUR LOCAL EMERGENCY CARE PROFESSIONAL OR FACILITY IMMEDIATELY. Jwalan Muktika School for Illumination Terms of Service! 5204 S. Sand Cherry Circle, Sioux Falls SD 57108 www.etechglobal.com Phone: (605) 339-4529 Merchant Service and Licensing Agreement AGREEMENT The EtechGlobal Online Store service ("EtechGlobal Online Store"
Copyright 2006. Sagicor Life Insurance Company. All rights reserved. IMPORTANT IT IS DEAMED THAT YOU HAVE READ AND AGREE TO ALL TERMS & CONDITIONS BEFORE USING THIS WEBSITE. Our services are hosted on the Blue Pathfinder website and officially supplied by Mark Corder Ltd.
Blue Pathfinder Terms and Conditions TERMS OF SERVICE OVERVIEW This website is operated by Blue Pathfinder, trading as Mark Corder Ltd. Throughout the site, the terms we, us and our refer to Blue Pathfinder.